There are endless choices when it comes to car speakers. It is wise to compare different products before making your final decision. There are various factors to examine when searching for speakers to install in your newly acquired car. Some of the things to look for in car speakers include configuration, size, quality of sound and price among others. 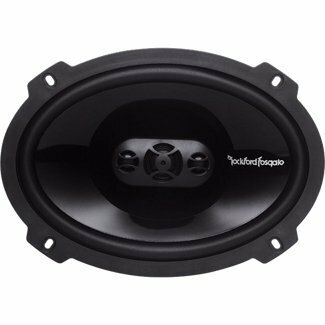 Rockford Fosgate Punch P1694 is among the best speakers on the market. The speakers boast of a sleek design, small size and affordable price. The flat black design is another aspect that has made this product more popular. Each of the speakers comes with four drivers and offers a frequency range of 60Hz-24 kHz. To find out more about these speakers, read on. When looking for speakers for your car you need to find those that will fit perfectly. The flex fit basket of these speakers makes them to fit into your car. This makes it easy to adjust your speakers upon mounting them. The concealed crossover of the speakers has been made such that it allows for easy transfer of frequency to the right components of the speaker while at the same time maintaining the compact design of the unit. Anyone who has been looking for speakers with compact look and fit in their cars properly can bank on these speakers. The basket design is probably among the reasons that have made these speakers one of a kind. The speaker delivers high sound quality, thanks to the Butyl rubber surround. In addition, the rubber surround makes the speaker durable. This means that you will not dig into your pocket a few weeks down the line in order to buy new speakers. In simple terms, these speakers will last for years. You should also know that the quality of sound produced by the speakers does not deteriorate with time like other low-quality products you are likely to find at the local market. Most buyers tend to ask themselves how they are going to mount their speakers in their car. Mounting these speakers in your car is not something to give you sleepless nights. The tweet mounting aspect of these speakers offers concentric clamping pressure around their mounting region. This implies that mounting the speakers in your car is going to be as easy as taking an evening walk at the park with your spouse or friends over the weekend. Rockford punch speakers will not disappoint you as far as power handling is concerned. The manufacturer has designed them such that they can support up 150 wa﻿tts. This power handling capability makes them better than other products. Individuals who want to enjoy quality music from the comfort of their cars can bet on these speakers to deliver the same. At 150 Watts, these speakers definitely belong to some of the leading products for both average and high-income earners. You can compare them with other products at the local or online stores to understand what it means to buy speakers with such as power handling capability. Dimensionally, the speakers are 6 x9 inches. This means that they will fit into your car with ease. You do not need to bother about where to place the speakers once you have acquired them from the online store or local market. It is wise to go for speakers that come with a warranty. The Rockford speakers are sold with a one year warranty. This implies that you will have the peace of mind you need when using the speakers because you have assurance that they will serve you for several years before you think about buying others. Also Read: Polk Audio DB691 Review. Do the speakers produce quality sound? The sound quality of these speakers is great. In fact, the speakers are second to none in terms of sound quality. To enjoy high quality sound, ensure that you are using both speakers. What is the role of OEM adapter plate feature? A great percentage of new models of speakers feature an adapter where you mount the speaker on and then the adapter is mounted on the door of the vehicle. This feature allows you to mount your speakers directly to the door of your car without going through much hassle over the same. In conclusion, Rockford speakers are simply the best. These speakers offer high quality sound. In addition, they are easy to install for both novices and experienced persons. Unlike other speakers that take much space, this product is small in size. The basket design makes it easy to fit them in your car after buying them. The sound quality, price, durability and design make these speakers worth your money. To purchase this product at an affordable price, you can check with online stores for better deals. If you have any question regarding automotive audio systems please read our Ultimate Car Speakers FAQs.